Maria Laura Mastellone, M.D., Ph.D.
Alhassana, A. R., Gabbayb, O., Arguellob, J. E. M., et al. (2010). Findings of the Waste Composition Study for the Aryee Diki electoral area of Accra New Town, Accra. Millennium Cities Initiative (MCI) The Earth Institute at Columbia University, 38. Alter NRG (2014). Syngas composition as obtained by a Westinghouse facility for municipal solid waste. Anarfi, W. (2013). Solid Waste Management in Ghana. Angelidaki, I., Ellegaard, L. & Ahring, B. K. (1998). Matematisk model for dynamisk simulering of den anaerobe biogas proces. : Inst. Miljotecknology. Appel, J., Bockhorn, H. & Frenklack, M. (2000). Kinetic Modelling of Soot Formation with Detailed Chemistry and Physics: Laminar Premixed Flames of C2 Hydrocarbons. Combustion and Flame, 121, 122-136. Archer, E., Baddeley, A., Schwager, J., et al. (2005). Mechanical-Biological-Treatment: A Guide for Decision Makers. Processes, Policies & Markets. Juniper Consultancy Services Ltd.
ASTM. (2014). Standard Test Method for Compositional Analysis by Thermogravimetry. Azapagic, A., Perdan, S. & Clift, R. (2004). Sustainable Development in Practice: Case Studies for Engineers and Scientists: John Wiley & Sons, Ltd.
B. Chang, N., Wang, H. P., Huang, W. L., et al. (1999). The assessment of reuse potential for municipal solid waste and refuse-derived fuel incineration ashes. Resources, Conservation and Recycling, 25, 255–270. Bailey, J. E. & Ollis, D. (1986). Biochemical Engineering Fundamentals, New York: McGraw-Hill. Bain, J., Tan, A., Mudgal, S., et al. (2012). Decoupling of Waste and Economic Indicators. WRAP. Baukal, C. E. (2006). The John Zink Combustion Handbook: CRC Press. Beenackers, A. & Swaaij, W. V. (1984). Gasification of Biomass, a State of the Art Review. In: Bridgwater AV (ed) Thermochem. Process. Biomass. London: Butterworths, 91–136. Bilitewski, B., Härdtle, G. & Marek, K. (1997). Waste Management, Berlin: Springer. Bockhorn, H., D'Anna, A., Sarofim, A., et al. (2002). Combustion Generated Fina Carbonaceous Particles. KIT Scientific Publishing. Bradbury, A. G., SakaI, Y. & Shafizadeh, F. (1979). Kinetic model for pyrolysis of cellulose. Journal of Applied Polymer Science, 23. Brunner, P. H. & Ernst, W. R. (1986). Alternative methods for the analysis of municipal solid waste. Waste Management & Research, 4, 147-160. Brunner, P. H. & Rechberger, H. (2003). Practical Handbook of Material Flow Analysis CRC Press. Brunner, P. H. & Rechberger, H. (2015). Waste to Energy - key element for sustainable waste management. Waste Management, 35. Bryden, K. M., Ragland, K. W. & Rutland, C. J. (2002). Modelling thermally thick pyrolysis of wood. Biomass and Bioenergy, 22, 41-53. Byun, Y., Cho, M., Hwang, S-M., et al. (2012). Thermal plasma gasification of municipal solid waste. In: INTECH (ed). CCT. (2013b). Calrecycle Conversion Technology Vendors. Available at: http://www. calrecycle.cca.gov. Cencic, O. & Rechberger, H. (2008). Material flow analysis with Software STAN. Journal of Environmental Engineering and Management, 18, 5. Chan, W. R., Kelbon, M. & Krieger, B. B. (1985). Modelling and experimental verification of physical and chemical processes during pyrolysis of a large biomass particle. Fuel, 64, 1505-1513. Chandler, A. J., Eighmy, T. T., en, J. H., et al. (1997). Municipal solid waste incinerator residues. Studies in Environmental Science, 67. Channiwala, S. A. & Parikh, P. P. (2002). A unified correlation for estimating HHV of solid, liquid and gaseous fuels. Fuel, 81, 1051-1063. Chen, F. F. (1984). Introduction to plasma physics and controlled fusion. Plasma physics. New York: Plenum Press. Cho, J. K. & Park, S. C. (1995). Biochemical methane potential and solid state anaerobic digestion of Korean food wastes. Bioresource Technology, 52, 245–253. Cordero, T., Marquez, F., Rodriquez-Mirasol, J., et al. (2000). Predicting heating values of lignocellulosic and carbonaceous materials from proximate analysis. Fuel, 80, 1567–1571. Corella, J., Narváez, I. & Orío, A. (1996). Advanced Gasification of Biomass with Downstream Commercial Steam Reforming Catalysts for Hot Flue Gas Cleaning: Comparison of Different Catalysts with Their Apparent Kinetic Constants for Tar Conversion. In: al. PCe (ed) 9th European Bioenergy Conference and 1st European Energy from Biomass Technology Exhibition. Pergamon. Corp. B. V. (2012). Cost and performance data for power generation. National Renewable Energy Laboratory (NREL). Deglise, X., Magne, P., Donnot, A., et al. (1998). Wood Tars Cracking in Gasifiers: Kinetics Data. Symposium on Forest Products Research International—Achievements and Future. Pretonn, Republic of South Africa. Demirbas, A. (1997). Calculation of higher heating values of biomass fuels. Fuel, 76, 431–434. Devi, L., Ptasinski, K. J. & Janssen, F. (2003). A review of the primary measures for tar elimination in biomass gasification processes. Biomass and Bioenergy, 24, 25-140. Di Blasi, C. (2002). Modeling intra- and extra-particle processesof wood fast pyrolysis. AlChe Journal, 48, 2386-2397. Di Blasi, C. (2008). Modeling chemical and physical processes of wood and biomass pyrolysis. Progress in Energy and Combustion Science, 34, 47-90. Ducharme, C. (2010). Technical and economic analysis of plasma-assisted waste-to-energy processes. Department of Earth and Environmental Engineering. Columbia University. Dunn, IJ., Heinzle, E., Ingham, J., et al. (2003). Biological Reaction Engineering: John Wiley. E4tech. (2009). Review of Technologies for Gasification of Biomass and Wastes. Eastman, J. A. & Ferguson, J. F. (1981). Solubilization of particulate organic carbon during the acid phase of anaerobic digestion. J. Water Pollut. Control Fed., 53, 352-366. Energy USEIA. (2014). International Energy Outlook 2014, World Petroleum and Other Liquid Fuels with Projections to 2040. Washington, DC 20585. EPA (1991). Vitrification Technologies for Treatment of Hazardous and Radioactive Waste. Technology transfer. Washington, DC: EPA. EPA (2012). Municipal Solid Waste Generation, Recycling and Disposal in the United States. Environmental Protection Agency. European Commission. (2006). Integrated Pollution Prevention and Control Reference Document on the Best Available Techniques for Waste Incineration. European Commission. (2011). Road Map to Resource Efficient Europe. European Commission, 1067-1068. European Commission. (2014). Proposal for a DIRECTIVE OF THE EUROPEAN PARLIAMENT AND OF THE COUNCIL amending Directives 2008/98/EC on waste, 94/62/EC on packaging and packaging waste, 1999/31/EC on the landfill of waste, 2000/53/EC on end-of-life vehicles, 2006/66/EC on batteries and accumulators and waste batteries and accumulators, and 2012/19/EU on waste electrical and electronic equipment. European Environmental Agency. (2009). Diverting waste from Landfill - Effectiveness of waste-management policies in the European Uninion. 68. EUROSTAT. (2014). Waste generation and management database. Available at: http://epp.eurostat.ec.europa.eu/portal/page/portal/waste/waste_ generation_and_management/management. Fellner, J., Cencic, O. & Rechberger, H. (2007). A new method to determine the ratio of electricity production from fossil and biogenic sources in waste-to-energy plants. Environmental Science and Technology, 41, 2579-2586. Foth. (2013a). Alternative Technologies for Municipal Solid Waste. Foth Infrastructure & Environment LLC. Fridman, A. (2008). Plasma chemistry, New York: Cambridge University Press. Fridolin, K., Gingrich, S., Eisenmenger, N., et al. (2009). Growth in global materials use, GDP and population during the 20th century. Ecological Economics, 68, 2696-2705. Gasification Technology Council. (2014). Gasification - An investment in our energy future. In: GTC (ed). Arlington, VA 22201. Gujer, Z. (1983). Conversion processes in anaerobic digestion. Wat. Sci. Tech., 15, 125-167. Gullet, B. K., Bruce, K. R. & Beach, L. O. (1990). The effect of metal catalysts on the formation of polychlorinated dibenzo-p-dioxin and polychlorinated dibenzofuran precursors. Chemosphere, 20, 1945-1952. Hagenmaier H., Kraft, M., Brunner, H., et al. (1987). Catalytic effects of fly ash from waste incineration facilities on the formation and decomposition of polychlorinated dibenzo-p-dioxins and polychlorinated dibenzofurans. Environ. Sci. Technol., 21, 1080–1084. Hagos, F. Y., Aziz, A. R. A. & Sulaiman, S. A. (2013). Study of syngas combustion parameters effect on internal combustion engine. Asian Journal of Scientific Research, 6, 187-196. Hansen, C. F. (1970). Thermodynamic and transport properties of high-temperature air. 320-333. NATO. Heberlein, J. & Murphy, A. B. (2008). Thermal plasma waste treatment. J. Phys. D: Appl. Phys., 41. Heo, N. H., Park, S. C. & Kang, H. (2004). Effects of mixture ratio and hydraulic retention time on single-stage anaerobic co-digestion of food waste and waste activated sludge. J. Environmental Science Health, 39, 1739–1756. Herguido, J., Corella, J. & Gonzalez-Saiz, J. (1992). Steam Gasification of Lignocellulosic Residues in a Fluidized Bed at a Small Pilot Scale. Effect of the Type of Feedstock. Ind. Eng.Chem. Res., 31, 1274–1282. Heywood, J. B. (1988). Internal combustion engine fundamentals, New York: McGraw-Hill. Hjelmar, O. (1996). Disposal strategies for municipal solid waste incineration residues. J. Hazardous Materials, 47, 345-368. Homann, K. H. (1998). Fullerenes and Soot Formation – New Pathways to Large Particles in Flame. Angew. Chem. Int. Ed., 37, 2434-2451. IPPC Bureau. (2006). Best Reference Document (BREF) Waste Treatment. In: European Commission (ed). Seville, Spain. ISWA. (2008). Management of APC residues from W-t-E Plants - An overview of management options and treatment methods. Janajreh, I., Raza, S. S. & Valmundsson, A. S. (2013). Plasma gasification process: modelling, simulation and comparison with conventional air gasification. Energy Conversion and Management, 65, 801-809. John, H Seinfeld. & Pandis, S. N. (2012). Atmospheric Chemistry and Physics: From Air Pollution to Climate Change: John Wiley & Sons. Juniper. (2007). Plasma technologies for waste processing applications: Juniper ratings report. Bisley, England. Juniper. (2008). The AlterNRG/Westinghouse plasma gasification process. Wate Technology Reports. Bisley, GL6 7NH England: Juniper Consultancy Services Limited. Kiel, J. H. A., Paasen, S. V. Bv., Neeft., J. P. A., et al. (2004). Primary measures to reduce tar formation in a fluidised-bed biomass gasifier. In: ECN (ed). Petten, The Netherlands. Korens, N., Simbeck, D. R. & Wilhelm, D. J. (2002). Process Screening Analysis of Alternative Gas Treating and Sulfur Removal for Gasification U.S. Department of Energy. Koufopanos, CA., Papayannkos, N., Maschio, G., et al. (1991). Modeling of the pyrolysis of biomass particles, studies on kinetics, thermal and heat transfer effects. The Canadian Journal of Chemical Engineering, 69, 907-915. Levenspiel, O. (1999). Chemical Reaction Engineering: John Wiley & Sons. Li, H. & Karim, G. A. (2006). Experimental investigation of the knock and combustion characteristics of CH4, H2, CO, and some of their mixtures. Journal of Power and Energy, 220, 459–471. Long, C. M., Nascarella, M. A. & Valberg, P. A. (2013). Carbon black vs. black carbon and other airborne materials containing elemental carbon: physical and chemical distinctions. Environmental Pollution, 181, 271-86. Mastellone, M. L. & Arena, U. (2008). Olivine as a tar removal catalyst during fluidized bed gasification of plastic waste. AIChE Journal, 54, 1656-1667. Mastellone, M. L. & Romeo, E. (2012). A comphensive analysis of waste collection and management data in an area arising from waste emergency. 4th International Symposium on Energy from Biomass and Waste. Venice. Mayoral, M. C., Izquierdo, M. T., Andrés, J. M., et al. (2001). Different approaches to proximate analysis by thermogravimetry analysis Original Research Article. Thermochimica Acta, 370, 91-97. McBride, B. J., Gordon, S. & Reno, M. A. (1993). Coefficients for calculating thermodynamic and transport properties of individual species. In: NASA (ed) NASA Technical Memorandum, 4513. Metcalfe, J. C. & Quigley, M. B. C. (1975). Heat Transfer in Plasma-Arc Welding In comparing plasma and gas tungsten welding arcs, significant differences are found in heat transfer distribution and efficiency. Welding Research supplement: 101-104. Miller, R. S. & Bellan, J. (1997). A Generalized Biomass Pyrolysis Model Based on Superimposed Cellulose, Hemicelluloseand Liqnin Kinetics. Combustion Science and Technology, 126(1), 97 - 137. Milne, T. A., Evans, R. J. & Abatzoglou, N. (1998). Biomass Gasifier ‘Tars’: their nature, formation and conversion. In: NREL (ed). Golden, Colorado (USA): National Energy Laboratory. Morf, L. S. & Brunner, P. H. (1998). The MSW incinerator as a monitoring tool for waste management. Environmental Science and Technology, 32, 1825-1831. Mott, R. A. & Spooner, C. E. (1940). The Calorific Value of Carbon in Coal: The Dulong Relationship. Fuel, 19, 242-251. Moy, P., Krishnan, N., Ulloa, P., et al. (2008). Options of municipal solid waste in New York City: A preliminary comparison of health risks and policy implications. J. Environmental Management, 87, 73-79. Nemerow, N., Agardy, F. J., Sullivan, P., et al. (2009). Environmental Engineering: Environmental Health and Safety for Municipal Infrastructure, Land Use and Planning, and Industry: John Wiley & Sons. Newell, R. (2011). Shale Gas and the Outlook for U.S. Natural Gas Markets and Global Gas Resources. In: EIA (ed). Paris, France. Niessen, W. R. (2002). Combustion and Incineration Processes: Applications in Environmental Engineering: CRC Press. Ojovan, M. I. & Batyukhnova, O. G. (2007). Glasses for Nuclear Waste Immobilization. WM’07 Conference. Tucson, Az, USA. Orío, A., Corella, J. & Narvaez, I. (1997). Performance of Different Dolomites on Hot Raw Gas Cleaning from Biomass Gasification with Air Ind. Eng. Chem. Res., 36, 3800–3808. Pérez, P., Aznar, P. M., Caballero, M. A., et al. (1997). Hot Gas Cleaning and Upgrading with a Calcined Dolomite Located Downstream from a Biomass Fluidized Bed Gasifier Operating with Steam—Oxygen Mixtures. Energy & Fuels, 11. Rakopoulus, C. D. & Michos, C. N. (2008). Development and validation of a multi-zone combustion model for performance and nitric oxide formation in syngas fueled spark ignition engine. Energy Conversion and Management, 49, 2924-2938. Ramboll. (2012). Waste-to-Energy State-of-the-Art-Report - Statistics. In: ISWA (ed) 6th ed. Copenhagen, Danmark. Ranzi, E. C. A., Faravelli, T., Frassoldati, A., Migliavacca, G., Pierucci, S. & Sommariva, S. (2008). Chemical kinetics of biomass pyrolysis. Energy & Fuel, 22, 4292-4300. Rao, M. S. & Singh, S. P. (2004). Bioenergy conversion studies of organic fraction of MSW: kinetic studies and gas yield–organic loading relationships for process optimisation. Bioresource Technology, 95, 173-185. Rensfelt, E. & Ekström, C. (1988). Fuel Gas from Municipal Waste in an Integrated Circulating Fluid-Bed Gasification/Gas-Cleaning Process. In: Technology. DLKCIoG (ed) Energy from Biomass and Wastes XII. Chicago: Institute of Gas Technology. Roth, J. R. (1995). Industrial plasma engineering: principles. Institute of Physics Publishing. Shafizadeh, F. & Bradbury, A. G. (1979). Thermal degradation of cellulose in air and nitrogen at low temperatures. Journal of Applied Polymer Science, 23, 1431-1442. Speight, J. G. (2013). Coal-Fired Power Generation Handbook. USA: Scrivener Publishing and John Wiley & Sons. Sridhar, G. & Yarasu, R. B. (2010). Facts about Producer Gas Engine. In: Ng NJaA (ed) Paths to Sustainable Energy. Croatia: In Tech. Stone, C. R. & Ladommatos, N. (1991). Design and evaluation of a fast-burn spark-ignition combustion system for gaseous fuels at high compression ratios. Journal of the Institute of Energy, 64, 202–211. Swana. (2011). Waste Conversion Technologies. Tendero, C., Tixier, C., Tristant, O., et al. (2006). Atmospheric pressure plasma: a review. Spectrochim. Acta Part B, 61. The World Bank (1999). Municipal Solid Waste Incineration. In: Technical Guidance Report. Washington, D.C. 20433, U.S.A.
TwE. (2014). Gasification Technologies Review – Technology, Resources and Implementation, Scenarios. Final Revised Report. Sidney: The Council of City of Sidney. University, C. (2010). Unites States of America Waste Map. Available at: http://www.seas.columbia.edu/earth/recycle/index.html. USEIA. (2014). Annual Energy Outlook: with projections to 2040. EIA: U.S. Energy Information Administration. Velis, C. & Brunner, P. H. (2013). Recycling and resource efficiency: it is time to change from quantity to quality. Waste Management and Research, 6, 539-540. Watson, A. Y. & Valberg, P. A. (2001). Carbon black and soot: two different substances. AIHA Journal, 62, 218-228. Westinghouse. (2012). Plasma torches In: orp. WPC-A (ed). Madison, PA USA. Westinghouse. (2013). Current state of WPC technology. In: 2013 OH (ed). Williams, P. T. (2013). Waste treatment and disposal: John Wiley & Sons. Zevenhoven, R. & Kilpinen, P. (2002). Control of pollutants in flue gases and fuel gases, Helsinki University of Technology, Espoo, Finland: Åbo Akademi University, Turku, Finland. Zhang, R., El-Mashad, H. M., Hartman, K., et al. (2007). Characterization of food waste as feedstock for anaerobic digestion. Bioresource Technology, 98, 929–935. 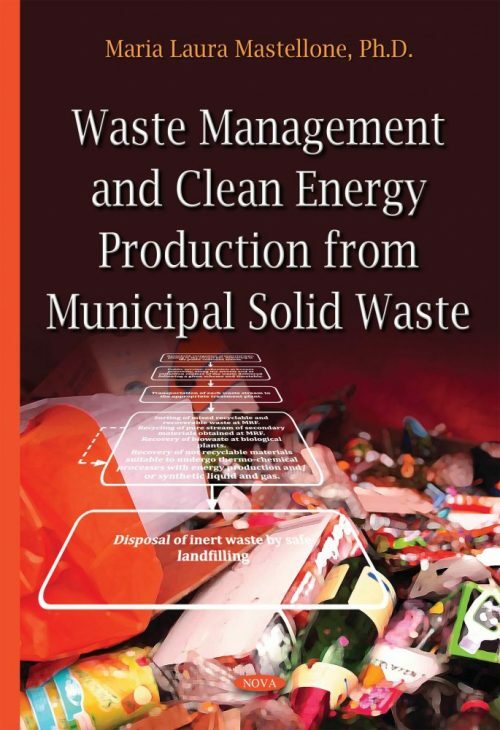 Audience: Waste management planners and stakeholders can find a guide about the correct implementation of a waste management system (WMS) by focusing at the real targets obtainable by the waste management. It is not necessary to be expert in the field or having an engineering background to achieve the largest part of the general information contained in the book even though the technical audience can obtain specific data about incineration, gasification and anaerobic digestion processes useful for designing purposes.